From early on I was keen for Princess to learn how to sew. Her grandmother and great-grandmother are very capable seamstresses, and I like to make things. I want her to grow up with sewing in her arsenal of tools for creating. She's a creative soul, and it's wonderful to nurture that. For her 6th Birthday, we purchased her a sewing machine of her own. We chose a real, proper machine, not a toy one - as cheap toy imitations are only going to produce frustration and are generally short-lived devices (in our experience). 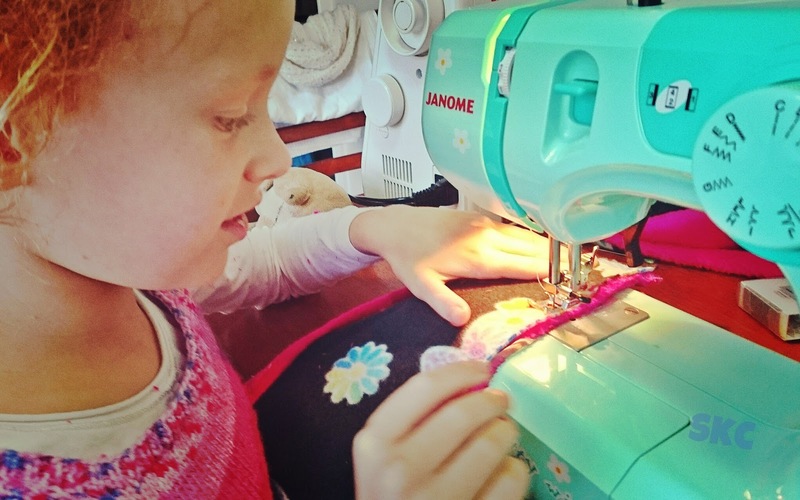 I heard about this Janome Hello Kitty (Yes, Really) machine for children on the Smashed Peas & Carrots blog. I added it to my wishlist on Amazon and promptly forgot about it (it isn't available in Australia). A year or so later, Amazon sent me an email saying it was half price. Which meant that even with crazy shipping from the States, it was more affordable than buying a simple machine in Australia. There isn't anything similar for children in Australia either. I guess the American market is so much bigger that they have more variety than we do. 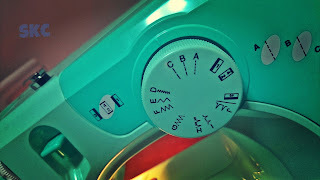 I do love this little machine - who wouldn't, it's teal!!! It's fairly simple. It's about 3/4 size, and it has enough basic features for a beginning sewist. The bobbin loading is the older style though, where it goes into the bobbin case, and then into the machine sideways. I have no idea where I used these before, but it all came back to me! Perhaps the school sewing machines from Textiles and Design many many years ago!?! However, I probably wouldn't buy it again, as Princess is now also capably using my sewing machine, grandma's sewing machine, etc! A good sewing machine is a lifetime investment if you look after it, even if you never use it a lot. So now, I would consider an 'adult' machine. Especially after Princess & I were lucky enough to win a pass to a Sewing Class with RetroMummy at the Better Homes & Gardens show last year, and to use the Brother Sewing Machine being promoted at the time. I liked it so much I'm surprised I didn't buy one on the spot! They are such easy machines to use, and they have lots of nifty features that make life much easier, like they can thread themselves. Any of the well-known brands should be reputable. I think most people tend to stick with the brand they grew up with! I would be hesitant to buy something cheap. But you don't need to go top-of-the-line either. I bought a Janome My Excel, which has the capability to be adapted for quilting, but which is a fairly basic machine. It's been working well for several years now. I spent a while collecting a number of great tutorials for teaching children to sew with a machine. On Pinterest I have a board all about it. I tried to collect simple, but fun, and purposeful things for children to make. 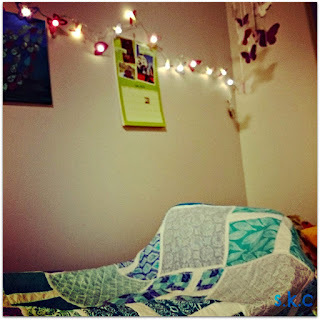 This blog post is written for a friend of mine who is also starting her daughter on a journey of creativity with sewing. Really, all I'm doing is linking to other people's ideas. I'm including here all the useful information and sites I found, and some of the things we say as a checklist for keeping Princess safe when she's using the machine. Pretty keen to avoid having to deal with a needle-impaled digit. Here is the link to my Pinterest board Kids Can Sew This if you would like to look through it for ideas - it includes strategies for teaching sewing as well as simple items children can sew. * Is your child still small? how are they going to reach both the sewing machine and the pedal? At first, Princess sat at a child's table and child's chair. Now she usually sits at the table with me, but we have a stable footstool for the pedal to go on so she can reach it. * Is your child good at following instructions generally? Can you keep them safe with the fiddly processes? * Prepare for monitoring them very closely at the start, and if they are young. It really does require your entire attention at first, as running a sewing machine is a fairly complex process, and has a few risks inherent. * Scissors!?! They need to be sharp so they can cut the fabric. Our whole household knows they are not to use my sewing scissors for anything!!! Princess has been allowed to use them, but only under close supervision because they are so sharp. Blunt scissors will just cause frustration. I usually ensure the fabric is lying on the table, the pattern is drawn on the design (with tailors chalk or pencil), and that fingers are out of the way of the cutting line holding fabric steady. * STOP! Teach your child to instantly respond to 'Stop' from you at any time!!! I got this tip from here . I have also found that if I am on the phone (because phone calls always come in the middle of things!) that I need Princess to respond when I hold my hand in a Stop signal. This has been very useful when I can't talk but need her to stop sewing. * We encourage her to keep her foot off the pedal at all times, especially when her fingers are organising thread & fabric around the needle, until she's ready to sew. So, now we've got that out of the way, what next? At first, we took the advice of Welcome to the Mouse House and started with paper sheets and no thread. This enables kids to develop some skills without having to worry about everything. I couldn't hope to explain things as thoroughly and clearly as she does, so please read her blog here. You will also be able to download her printables for kids to practise steering the machine! I do agree with her, that whatever the age of your child, it's all about the repetition & practice to remember to do the same things in the same order every time! We also made a point of reciting the order of instructions at the beginning with Princess, and having her recite with us. She is on top of this now, although I stay near by to keep an eye on her. You could also use some simple dot-to-dot pictures if you feel your child needs some more practice, especially if they have a special interest! I like this Dragon Dot to Dot and this one for my friend's gorgeous girl. Thomas the Tank Engine would be more up my dude's alley when he's ready to start sewing! After this, we moved on to using thread, and paper (still!). This allowed Princess to learn how to thread the machine, and therefore to check it is threaded correctly each time; how to hold on to the threads when starting sewing, and how to back stitch at the beginning and end of sewing. Finally we used some fabric! We experimented with each stitch that is available on her machine, and explored the different widths. 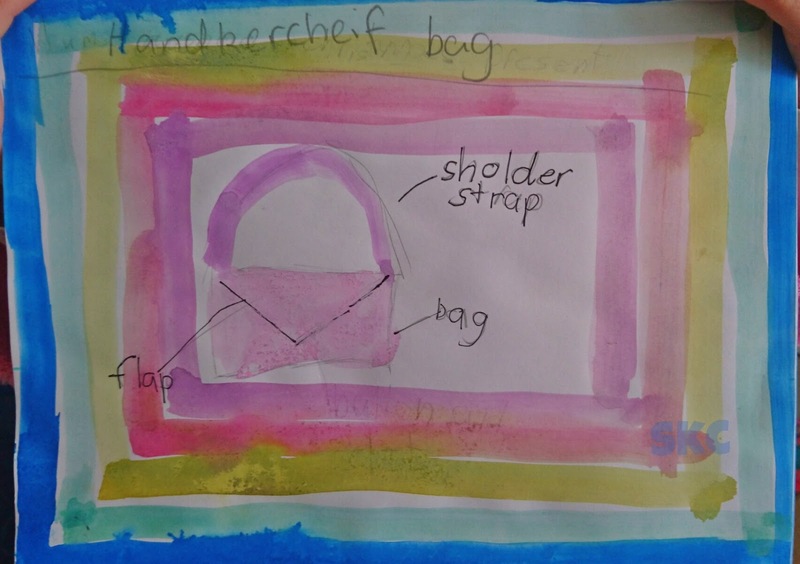 Really wise advice for projects about simple, achievable projects that are good to start with, here at Handmade Kids. We have had some grand plans go to sit in the UFO (Un Finished Objects) basket because they were a little too complex to complete in our small slots of time. * Bunting - lots of practice cutting and sewing straight lines, also learning how to pivot. * A simple Apron, I really like this one here. But I would make it even simpler by using a grosgrain ribbon or belt band (from Spotlight) rather than making it! * Simple Christmas Decorations - such a lovely gift for teachers and grandparents: Triangle Christmas trees are quite manageable. Just don't expect them to make like a production line and churn out 20 of the things. Getting more than 1 made is highly unlikely! * A cushion cover - but be prepared that this needs accuracy in measuring and straight lines for these! * Anything the child is motivated by!!! Princess likes designing things (like most kids, really), so for her that process is really rewarding. The challenge has been to reign it in so that she gets to experience the process and outcome of designing and making something come to life! 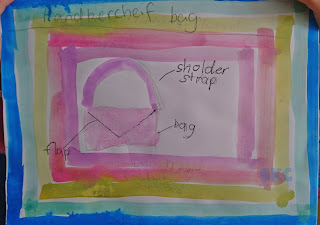 Princess (independently) designed me a little bag last year, which I use for hankies. I was so thrilled. So was she! A photo of the bag will appear shortly! Felt and Fleece don't fray, so they don't require the edges to be finished. Therefore they are fabulous for quick, motivating projects! Get kids involved. See what they love and what they would love to make. Pinterest is a wealth of ideas that other people have done all the tricky thinking for! We are going to have a Kids Sewing Day this week, and we are going to develop something themed around Dragons/Pokemon and Foxies (popular in our house!). We are hoping to make pillows - I'm hoping ours will work as car pillows for our holiday driving, based on these ideas here and here. Although teaching Princess has slowed down my own sewing projects, it has been so worth it to see her learn and enjoy. We were making some special things as gifts together yesterday, and it was wonderful to see her joy in creating things for her friends, and great for me to have an assistant to hand the straight sewing over to! Princess has planned the blog post about that for you all too! * I have a fellow fabric addict - so I have to restrain my own and someone else's fabric hunger! * I have to let go of my own ideas for how things should look / turn out, and let her own her projects and her design. Have you had success sewing with your children? I'd love to hear any suggestions for great strategies and projects! What a great way to share your passion! My Miss E and I have collected patterns and chosen fabric. She has cut the pattern and I have cut the fabric. That's as far as we got as I realised I need to teach myself how to sew again and I was nervous of myself making a mistake! I'm so pleased this has been helpful! I started with many many simple projects myself - bunting is fabulous for this! Come on over some time if you want a hand! Oh wow! A hello kitty machine!! How cute!